Holley doesn't offer anything for the big block Ford engine, so I was on my own every step of the way (MPFI conversion & DIS/SEFI upgrade). Of course, this also meant fabricating a custom 60-2 crank trigger kit myself. Not exactly for performance gains, in terms of power. However, electronic EFI distributors usually exhibit slight "timing jitter", especially at idle and when revved quickly. Anyway, the crank trigger completely eliminates any timing instability and provides rock steady/accurate timing through-out the RPM range. Also, the 60-2 trigger wheel enabled me to easily convert to Holley's waste-spark DIS (LINK), which allowed me to modify/convert my current distributor into a cam sync/oil pump drive unit (LINK) at a later date. I fabricated the crank sensor mounting bracket myself. Top hole is slotted for angular positioning. I'm using a commercial grade Cherry GS100502 geartooth sensor (stainless steel version available too). UPDATE: I upgraded to the industrial grade stainless steel version - Cherry GS100102. the Cherry GS100502). These are both 12mm x 1.0 threaded, 3-wire (22 AWG x 39"), Hall-Effect (solid state) sensors. I purchased a custom 6" 60-2 trigger wheel (6" O.D., 1.375" I.D.) from Miller's Mule Machine & Design ($40). I gave Jason at Miller's Mule all the dimensions (O.D., I.D., even the depth of the two missing teeth). so you can finish-fit the wheel. You can also ship him your damper and he'll attach the wheel for you. UPDATE: I'm now using the Holley 556-107 6" 60-2 trigger wheel. It works just as good as the one from Miller's Mule. Holley EFI typically uses the 9th-12th tooth, after the missing teeth (in direction of rotation), to align with the crank sensor. This is performed with #1 cylinder at TDC. The crank sensor mounting bracket can be positioned anywhere around the trigger wheel. I machine cut the damper's spacer myself, by installing an 1/8" thick die grinder disc/arbor in my drill press. I made one cut to remove 1/8"
No belt driven accessories needed to be moved, and the trigger wheel is well protected behind the slightly larger diameter vibration damper. I contacted the Cherry Engineering Department, after reading the above description on their geartooth sensor webpage (attention to blue details). I was pleasantly surprised to read their response, which stated that .005" of radial run-out was acceptable. Of course, this doesn't mean we can be sloppy with our trigger wheel installations, but there is a tolerance. The stainless steel sensor I used has the same specifications listed above, but is easier to adjust gap because it's threaded with two jam nuts, and it's more durable than the plastic version. I use .025" sensor gap. • I retained the original OEM 460 cast iron spacer (between damper & crank); it's just cut into two pieces. The now two-piece spacer is simply sandwiching the trigger wheel, held tight by the big crank bolt. This allowed me 360° of rotational adjustment, before grinding the keyway into the trigger wheel. The 1/8" material (cut) that I removed is reoccupied by the trigger wheel's 1/8" thickness, so no engine hardware/spacing changes are required. Not so, if using an MSD crank trigger kit, which requires moving the belt driven accessories forward 3/8" because the trigger wheel is positioned between the damper and crank pulley. This also allows me to remove/replace the crank pulley without tampering with the trigger wheel installation. • The trigger wheel needs to be centered on the crank snout to prevent excessive radial run-out. I obviously ordered the trigger wheel with a 1.375" center hole, however, the implication here is the 429-460 crank snout isn't precisely 1.375" all the way across its length. It's slightly thinner (.010") where the spacer is located. I've verified this on two other 429-460 crankshafts. To rectify this situation, I simply wrapped one layer of masking tape (typically .005" thick) around the crank snout where the spacer's cut is located. (For reference, typical packaging tape is about .003" thick, if your application has less clearance or you can use both if more is required.) This centers the trigger wheel before you tighten the big crank bolt. The masking tape is only for initial installation and has absolutely no mounting/holding purpose after the crank bolt is tightened to 90 ft/lbs (in fact, the tape could disappear and it wouldn't change anything). • Holley's waste-spark DIS system gets its signal from the two missing teeth on the 60-2 trigger wheel (one missing tooth on a 36-1). It's "waste-spark" because the missing teeth send the TDC signal every time #1 cylinder is up (near TDC of compression stroke and near TDC of exhaust stroke). It doesn't know when the #1 cylinder is ONLY on the compression stroke, hence the need for a cam sync sensor for sequential use. If you don't need or want sequential injection, then you just need an oil pump drive plug. In other words, the missing teeth (60-2/36-1 trigger wheel) are only for DIS ignition and the cam sync sensor is only for sequential fuel injection. If you're not using the 60-2/36-1 crank trigger with Holley's DIS, then a cam sync sensor must be used (sequentially injected or not). • Another advantage to using a 60-2/36-1 crank trigger kit with sequential injection & waste-spark DIS, is the ability to run the engine solely off of it, if the cam sync sensor fails. If you have a laptop computer* with you, enter the Ignition Parameters and change the Cam Sensor type to "Not Used" (non-sequential mode), and continue on your way. A nice emergency capability, that's not possible with a conventional 4x crank trigger (such as an MSD Flying Magnet kit). * FYI: The 3.5" & 5.7" LCD Touchscreens can also change Global Folders (create a non-sequential emergency GF), by storing them on the SD Card. And now the Digital Dash is also capable of storing/changing Global Files, except it's stored on a USB flash drive. • Engine reliability is a top priority for me (especially on watercraft & off-road vehicles). I have an off-road truck and I wouldn't install the typical crank trigger kit in an abusive application. So I custom made my own 60-2 crank trigger kit. My crank sensor bracket is steel, compact and mounted high & close to the engine. I like the sensor's stainless steel construction, because it's very durable & impact resistant to off-road debris. I have a spare Cherry GS100102 sensor, so if it ever goes bad, I don't have to wait for a new replacement. Also, my six inch 60-2 trigger wheel is well protected behind the slightly larger diameter vibration damper. On almost every aftermarket crank trigger kit I see, I don't like how low the sensor mounts and how far forward it is from the engine. 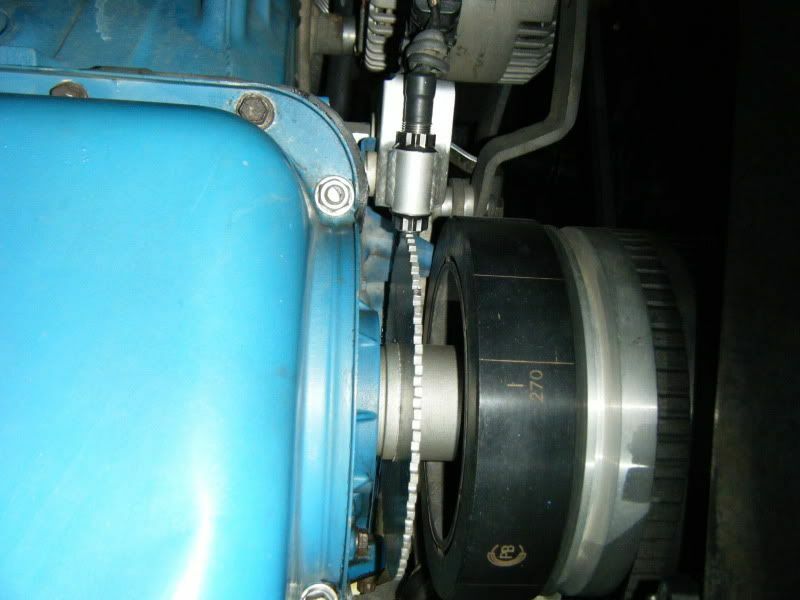 The typical aftermarket crank trigger kits are very susceptible to impact damage in off-road environments. • The timing stability is excellent (rock steady), especially at idle and when cranking! I noticed the Idle Spark Control is more effective with a 60-2 crank trigger kit, therefore requiring an adjustment of those parameters. Holley's .015"-.030" air gap specification (60-2 trigger wheel) is imperative; I tried a tad over .040" and the timing scattered. • Remember, for custom 60-2 crank trigger installations, the crank sensor mounting bracket can be positioned anywhere around the trigger wheel. The 9th, 10th, 11th or 12th tooth (after the missing teeth) just needs to align with the crank sensor, with the #1 cylinder at TDC. Since it's "waste-spark" ignition, it doesn't matter if the TDC #1 cylinder position is on the compression stroke or exhaust stroke. If using a single pulse cam sync, its 110°-250° BTDC #1 cylinder position MUST be on the compression stroke (not the exhaust stroke)! 1) The ECU already has the pull-up resistor for sinking output (open collector) sensors inside, so don't add anything. 2) The ECU already has the shield (drain) wire connection/pin grounded inside, so don't ground it at the sensor end. Think of the shield wire as an antenna pointing to the sensor; it's only supposed to be grounded at the ECU end. If running a magnetic pickup, either a crank trigger or a distributor: To run just a magnetic pickup crank input and no camshaft input, PN 558-303 should be purchased. If a cam sync input will be used as well, it is recommended to use PN 558-306 which will contain wiring for both the crank and cam sensor inputs. It is critical that properly installed shielded and grounded cable is used when using a magnetic pickup, or it is likely that EMI will disturb the crankshaft signal. Both PN 558-303 and 558-306 come with the proper cabling. It must be installed properly as well. Make sure that the shield is properly grounded which requires it being grounded at the ECU with that ground maintained through the ignition adapter connection. FYI: The MSD 2-pin connector (LINK) is a TE Connectivity, Commercial Mate-N-Lok, Free-Hanging #1-480318-9 Plug Housing & #1-480319-9 Cap Housing. 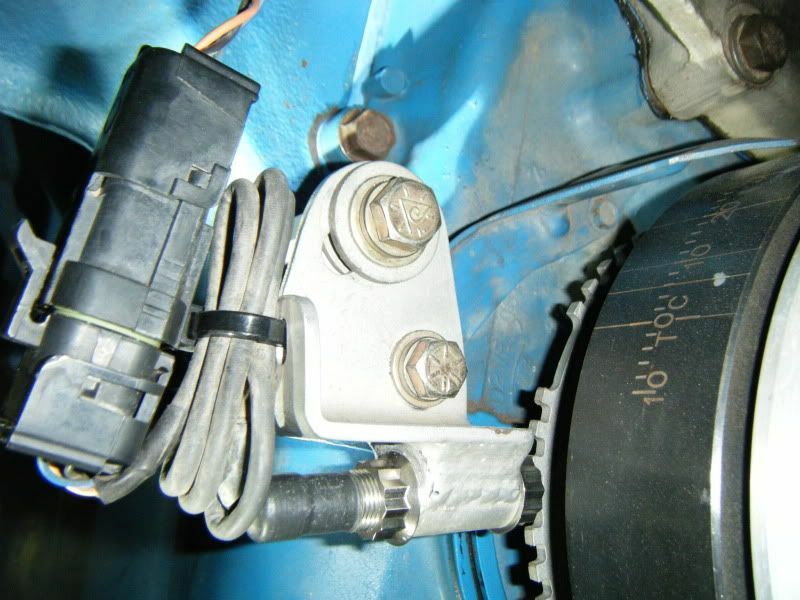 Note: The end user must supply the proper connectors/terminals for the crankshaft & camshaft sensors they choose to use with their Holley EFI system. Note: If using an MSD Flying Magnet 4x crank trigger kit, it's highly recommended to use Holley's 554-118 Hall-Effect replacement (direct-fit) crank sensor. FYI: I've been contacted a few times about the jam nuts I'm using with my Cherry GS100102 crank sensor. I didn't like the cheap, thin hexagon jam nuts that came with the Cherry geartooth sensor. They also look unprofessional, and it was awkward using two 3/4" wrenches on such thin nuts in a cramped location. So after a search for stainless steel 12mm x 1.0 metric nuts, I found the ARP 400-8347 12-point nuts you see in the pictures above (.504" tall & .750" O.D.). I machined them shorter and machined the flange thinner. They use a 14mm 12-point wrench. Alternate Nuts - stainless steel 12mm x 1.0 metric hexagon nuts: ClassicAndExotic.com MISC-0259 (11/16" wrench - LINK), or McMaster-Carr.com 91938A160 (3/4" wrench - LINK). Alternate Sensor - stainless steel 12mm x 1.0 (2" length), ferrous metal targets only, 8-20 volts, .040"-.080" gap: Holley 554-124 Hall-Effect Sensor (Instructions). Here's a good inexpensive HSS 12mm x 1.0 metric tap (LINK) & die (LINK) for thread cleaning or custom work.